1. 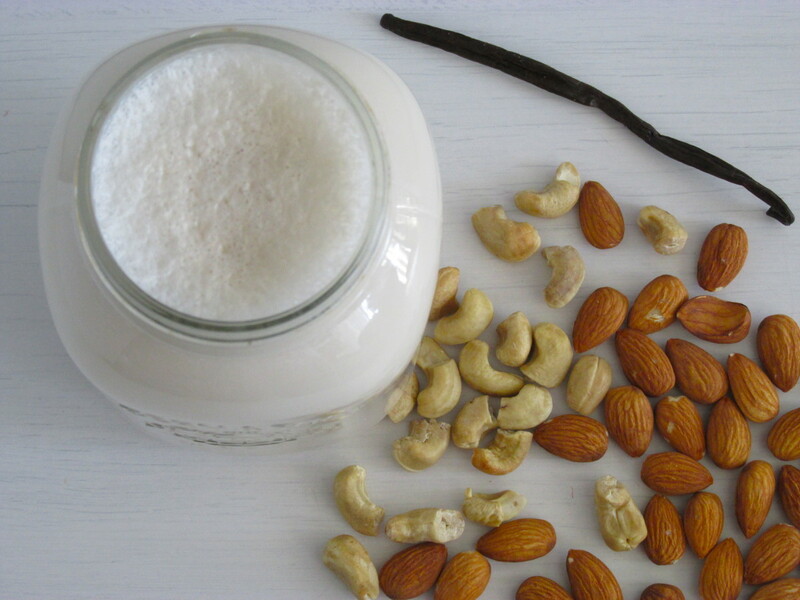 Soak almonds in water overnight (8-12 hours) or at least 1-2 hours. When soaked, most nuts & seeds release enzyme inhibitors, they become more digestible and it’s much easier to blend. 2. Drain and rinse the almonds (don’t keep the soaking water). 3. Blend almonds with filtered water in a strong blender on highest speed for around 60 seconds. 4. Place your nut milk bag over a big bowl and slowly pour the mixture into the bag. Gently squeeze the bag to release all the milk. Pour into a glass jar and store in the fridge for up to 2-3 days. Optional: Blend your squeezed almond milk with pitted dates (soak them to make it easier for the blender or use soft medjool dates), a pinch of salt and a bit of cinnamon, vanilla or cacao to make it real delicious! Smoothie-Tip: Blend plain almond milk with fresh or frozen fruit (e.g. blueberries), add sweetener (to your taste) to make fantastic vegan, healthy milk shakes and smoothies!